How do you make a sequel to a film that so obviously was not made to have a sequel? Especially when the film in question was brilliantly smart, clever, exciting, and funny all at the same time? According to the makers of “National Treasure: Book of Secrets,” you just remake the original film and take away all the intelligence. The film starts with Ben Gates (Nicolas Cage) and his father Patrick (Jon Voight) giving a speech about Thomas Gates, Ben’s Great-Great Grandpa, who died protecting a secret. Mitch Wilkonson (Ed Harris) then shows up with the missing page from John Wilkes Booth’s diary that implicates Thomas in the assassination of President Lincoln. In the next few minutes, we find out that the page is actually the beginning of a giant trail leading to the lost city of gold, and Ben figures if he finds the city of gold his grandpa will be remembered as the hero he really was. I don’t exactly see the logic in that, but Ben gets all his friends back together, including show-stealer Riley and his ex-girlfriend Abigail. The exact same FBI agent from the first film even gets back into the action, and together, they all go treasure hunting again. 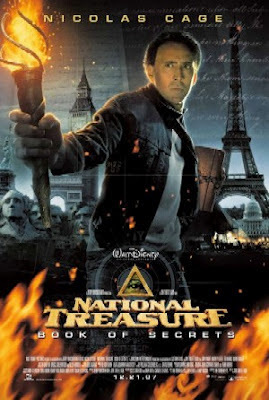 The first National Treasure was certainly a surprise. It channeled the spirit of many great adventure films like Indiana Jones, but did it in an incredibly smart way. The history sprinkled onto every single clue made it an incredibly intellectual adventure, and the ultimate payoff of finding the treasure was better for it. It’s a perfectly crafted film, and I love rewatching it. But it didn’t need a sequel, and “Book of Secrets” is proof of that. This film is merely a sorry retread of everything that worked in the first installment, but, as I said, without all the intelligence. Basically, they follow a bunch of ‘clever’ clues to find a lost treasure, but not one of these clues gives you the same excited feel that the clues in the original film did. For one, very little history is sprinkled into the mix this time, and the history that is happens to be quite boring and uninteresting. While the original had plenty of twists and turns, the lack of originality or thought in the treasure trail of “Book of Secrets” is as predictable as it could be. Obviously, this one is aimed at little kids who like treasure hunts without having to put much thought into it, which means this film is for a completely different audience. This is quite a shame. But even a flawed plot can be saved by good characters. Since every character was extremely well developed in the first film, you’d think that “Book of Secrets” could be saved by its characters. You’d be wrong. Nicolas Cage is just on autopilot throughout the movie, and because of it, his character never emanates the great intelligence he did in the first film. Diane Kruger as Abigail is just a whiny jerk through the greater portion of the film. Jon Voight actually seems to be the only one really trying in the film, but his character is written so poorly that it all becomes awkward. As Riley Pool, everyone’s favorite character, Justin Bartha again steals the show, but his character does seem like a greatly simplified version of the one in the original film. Ed Harris, normally a great villain, is just weak in this film. Like Cage, he’s on autopilot. I’d never think I’d write this, but in this situation, Sean Bean does the job a hundred times better than Harris. So what does all this add up to? A lazy, generic, and underwhelming adventure film. It’s a shame, considering the quality of its predecessor. I also think the plot about the missing pages from Booth’s diary could have made a really great, smart film, but it was just a way to get them to go looking for treasure again, and “Book of Secrets” certainly isn’t one. So many scenes in this movie seem to be sequences trying to top sequences from the original film. For instance, how do you go bigger than stealing the Declaration of Independence? You decide to kidnap the president. At this point in the film, they actually build some good momentum. Unfortunately, we find out that kidnapping the most powerful man on earth is as easy as stealing candy from a baby. But, once again, this sequel is aimed at the kids, who will no doubt think this scene is genius. Here’s a suggestion, parents. Skip this one and show the first film to the young ones. Help guide them through all the complex historical stuff, and they’re bound to come out of it with some good education. To those who want to see this because they enjoyed the original film, I’d advise against seeing it in theaters, what with the highly inflated ticket prices. It may be worth a rental a few months down the road, but only if you’re really curious about it.